Pizza is a treat everyone loves. 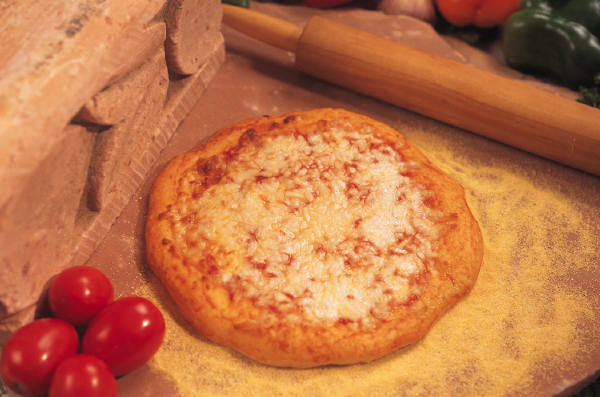 Of course, pizza can come in many forms – homemade, frozen, fresh-to-oven, delivery, and gourmet. This tasty recipe can be made a little healthier. I also like it because it allows everyone to select their favorite toppings. I’ve made this for myself as well as for dinner parties. I just set out the ingredient options and let people pick. With personalized pizza, you can make vegetarian as well all meat options. One of the other reasons I like this recipe is because it allows you to make a breakfast or dinner pizza. Line a cookie sheet with foil. Split the English muffins in half and place on cookie sheet. 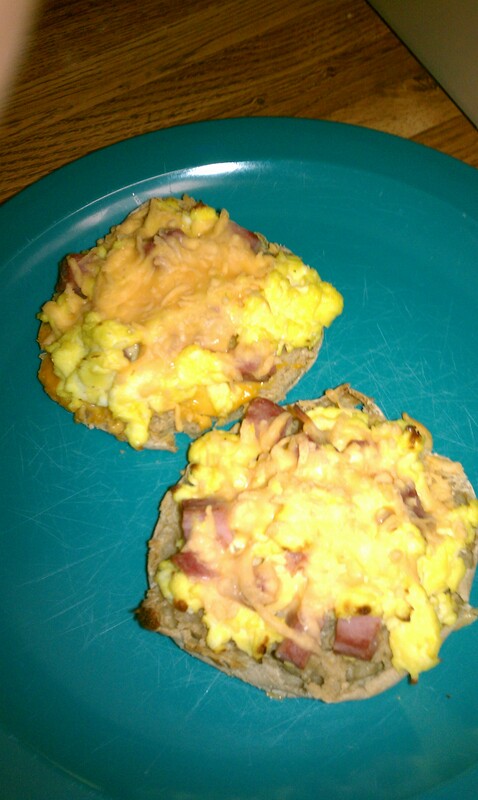 Spread pizza sauce on muffin. Top with desired toppings. Sprinkle with cheese. Bake at 425 degrees for 6 minutes or until cheese is melted. I like to use 100 calorie, light multi-grain Thomas English Muffins. I think they have a more natural crust taste plus they have 8 grams of fiber. They are more expensive at the grocery store than other brands but you can usually get a good deal on them at Sam’s Club. My sister likes to substitute pita bread in this recipe. I’ve also made Chicken Alfredo mini-pizzas. Just use a light Alfredo sauce (I like to make my own with Wildtree Alfredo Extraordinaire which can be made with skim milk for a much healthier and more flavorful sauce), grilled chicken breast chopped, spinach, and low-fat mozzarella cheese. You can also make breakfast pizzas. I like diced ham, scrambled eggs, and cheddar cheese. Sometimes I add a little canned nacho cheese sauce to the base of the muffin for a little extra zing. If I was making this for my sister, I would make a scrambled egg white, diced bell peppers, and a touch of mozzarella cheese on top. I also think you could make this with thinly sliced ham, a poached egg, and slice of cheddar cheese. I think it would look like an eggs benedict but without the heavy hollandaise sauce on top. Over the years, I have picked up a couple of cool kitchen tips. I hope these things are useful for you. Foil is your best friend. Line your dishes with it for easy clean up. Non-stick foil is worth the extra money. Buy meat when it is on sale. Separate meat into serving sizes you will use and wrap in non-stick foil. It really does peel off your meat easier than traditional foil. For perfectly cooked crispy bacon with little clean-up – Line a cookie sheet with foil. Place bacon strips separately on cookie sheet. Bake at 400 degrees for 14-16 minutes (Source – Hen House Holiday Open House). Use a plastic knife to cut into warm brownies. They don’t stick to the plastic the same way they stick to a metal knife. When making bon bons (cake pops or Oreo balls), always melt the almond bark in the microwave. Way easier to work with than preparing on the stovetop. Take a plastic fork and break out the middle prongs. When you make bon bons, freeze the balls for an hour. Use the plastic fork to dip into coating. It really does make it easier (Source – Taste of Home Cooking Show). Invest in a good set of knifes. It truly does make a huge difference when you are chopping hard things like carrots, apples, and frozen meat. (Lesson learned while working as a kitchen helper at the University of Nebraska – Lincoln Harper-Schramm-Smith Dining Hall). Freezer baggies are a great way to marinade and coat meats. You can also put the meat in the freezer and when you pull it out to make the dish, the meat is already ready to go. Metal bowls work best for cookie dough that need to be refrigerated. The metal conducts the cold air making the dough chill faster. Always keep a pair of scissors in the kitchen drawer. This recipe came from an old co-worker who was participating in Weight Watchers at work. Through her, I learned that pumpkin is a vegetable. And in the Weight Watchers world, that means zero points. The amazing thing about cooking with pumpkin is that you can’t taste it in the dish. Unfortunately, the price of canned pumpkin has gone up significantly because more people are using it in their baking. So don’t be afraid to buy the store brand. I hope you enjoy. Grease one muffin tin. Mix together first two ingredients and spoon into muffin pan. Spray non-stick cooking spray on finger tips and smooth edges of muffins. Bake 375 degrees for about 18 minutes. Cool and serve with whipped topping. Each muffins = 2 WW points. You can use any cake mix to make this recipe. Please note though if you use a light colored mix, such as lemon, you muffins will be a light orange color. This recipe is also good served with mixed berries. Note – pumpkin is very moist and can get moldy rather quickly. Refrigerate if you don’t eat them all in 3-4 days. Then zap in the microwave for a few seconds to take the chill off before serving. I’m feeling a little under the weather today so I decided to try a new soup recipe. One of my favorite soups is the Overloaded Potato Soup at O’Charley’s. Unfortunately, we no longer have locations in the Kansas City metro area. I looked online for a copy cat recipe. The result was a kitchen disaster that had to be thrown out. While looking through my “Roostin’ in Wayne” cookbook, I discovered a recipe that might be similar to the soup I was craving. This cookbook was created in my hometown to commemorate the 125th anniversary of our town as well as honor our annual event “The Chicken Show”. If you are old enough to remember Johnny Carson hosting The Tonight Show, then perhaps you have seen some of “The Chicken Show” Cluck-off Champs. Last year, “The Chicken Show” was named one of the top hometown festivals by Parade magazine. This is a little plug because my aunt who works for the Wayne Area Economic Development. Irene was also on the Cookbook Planning Committee which brought this wonderful recipe into my life. Brown and crumble bacon. Saute onion in bacon grease. Add cubed potatoes, water, salt, and pepper. Simmer for 15 minutes until potatoes are done. Mix soup, cheese, sour cream, and milk together, and to mixture. Heat thoroughly. Serve with sprinkle of parsley on top (optional). Creator also notes you can use Hormel Real crumbled bacon and onion flakes if you don’t have much time. I used frozen potatoes and saved a bunch of time prepping this dish. I doubled the amount of cheese (8 oz.). I did not have onions or onion flakes so I used onion salt. It worked just as well. I think you might also consider using green onions. I also omitted the celery because the O’Charley’s recipe did not have that in it. My recommendation – I would add this to my recipe rotation. It’s a hearty dish on a cold, rainy night. America is obsessed with high fat and sugary foods. Why? Because they taste good. But is Paula Deen to blame for people’s bad eating habits? No. In the January 25th issue of the Kansas City Star, Columnist Jenee’ Osterheldt reminds us that we are responsible for what we put in our bodies. I’ll be the first to admit, I love Paula Deen. She seems very friendly and down to earth. I’m completely impressed with the way she overcame panic attacks and agoraphobia to become one of America’s most recognizable celebrity chefs on television. With just $200 she started a catering business from her home. I think, I also read somewhere her cooking helped her escape an abusive marriage. Rock on! Is it any of our business that Paula Deen did not disclose she was diabetic until a few weeks ago? Not really. 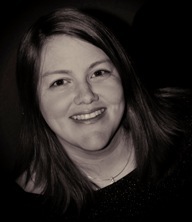 It’s a personal matter and how many of us want to share our personal medical histories? Did eating unhealthy contribute to her becoming diabetic? Perhaps. But let’s be honest, how many of us do things that we know aren’t good for us? Smoking. Not working out daily. Not going to the doctor on a regular basis. We are all guilty of some sort of unhealthy habit that we know we need to change. I’ll be the first to admit, I have never baked a Paula Deen dish. Why? Because I know butter, heavy whipping cream, oil, bacon aren’t good for me. But I do own Paula Deen knives and a cast iron skillet – she makes great cookware. Do I eat super healthy? No. Do I try to eat healthier using less fatty foods and adding vegetables to my dishes? Yes. I also try to limit my eating out because I know cooking for myself is healthier. I am also trying to get back into my workout routine. My point to this article is that my blog will contain some “not so healthy” dishes. If you so desire to bake these recipes, I would encourage you to do them in moderation. And don’t blame me if you gain a few pounds. This recipe I would call a “comfort food” dish. 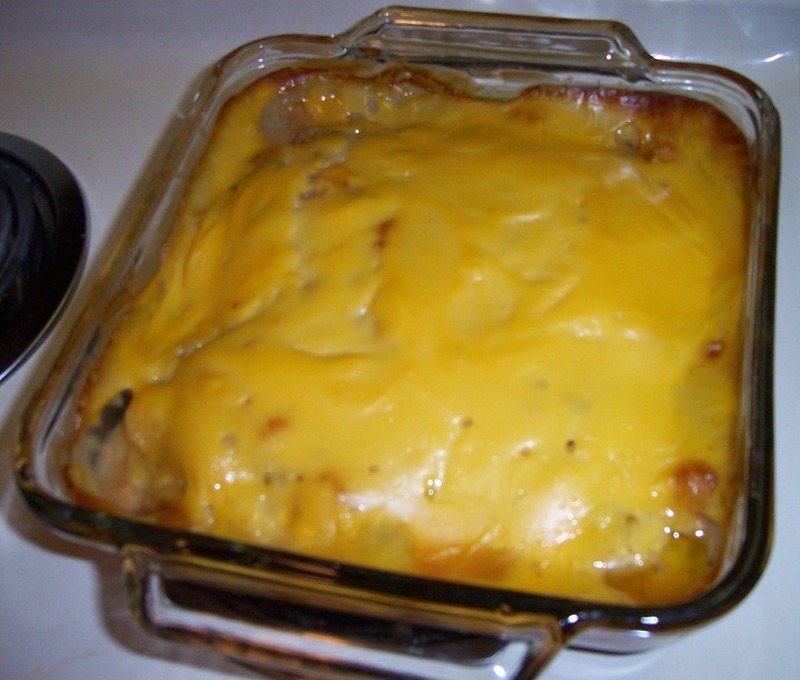 My mother used to bake Hamburger Casserole for my family as far back as I have memories. (In fact, I’m pretty sure I missed out on a few Flavor Ice pops back in the day because I picked out the onion rings.) I assumed every Midwestern family made this recipe. While talking with a co-worker a few months ago, she was telling me how she downloaded a “Tater-tot casserole” from the Dugger’s website. (Yes, the 18 Kids and Counting family). She loved the dish. That’s when it occurred to, perhaps not everyone tried this dish or maybe your mother’s cooked it a little bit differently. Spread uncooked meat into the bottom of a 8 x 8 square dish. Cover with tater-tots. Spread cream of celery over mixture. 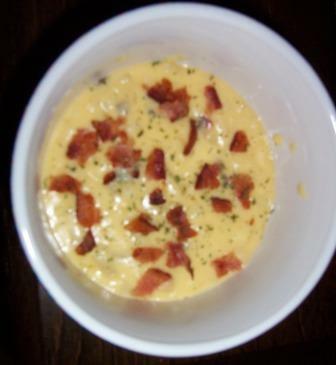 Top with cheddar cheese soup. Bake at 350 degrees for 1 hour. You can use fat-free or healthy request soups and 93% lean ground beef. My mother sometimes used cream of mushroom soup instead of cream of celery. It’s your preference or what you have in the cupboard. My mom also liked to top the tater tots with onion rings. You could do this or add onions to the recipe. You can also make this in a 9 x 13 dish. It just means your pieces won’t be as thick. I’m single so I prefer to make it in a 8 x 8 so I don’t have to eat it for several days. As always, I would love to hear your feedback on issues or the recipe presented in this post. My co-workers joke about how much I use crescent rolls in cooking. But truth be told, you can use them in just about any dish. 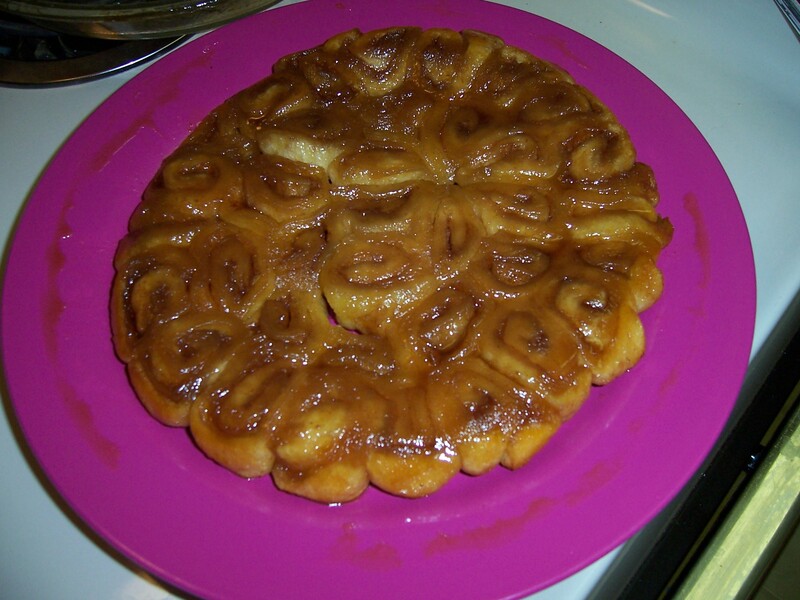 I got this recipe from the December 2011/January 2012 Taste of Home – Simple & Delicious magazine. I would totally suggest on picking up a copy – I have made at least four dishes from it. This particular recipe I made over Christmas break while I was at my mother’s house. Stephanie and I had to remind ourselves to save a few for my mother (who was at work that morning). It’s probably the best new recipe I have made in months and super easy to do. In a small saucepan, combine first four ingredients and cook over a medium heat until dissolved. Pour into greased 9-in. pie plate. Separate crescent dough into four rectangles (or cut sheet into four pieces). Combine sugar and cinnamon. Sprinkle evenly over rectangles. Roll up jelly-roll style, starting with the long side. Cut each into nine pieces; place cut side down into prepared pie plate. Bake at 375 degrees for 15-18 minutes or until golden brown. Cool for 1 minute before inverting onto plate. 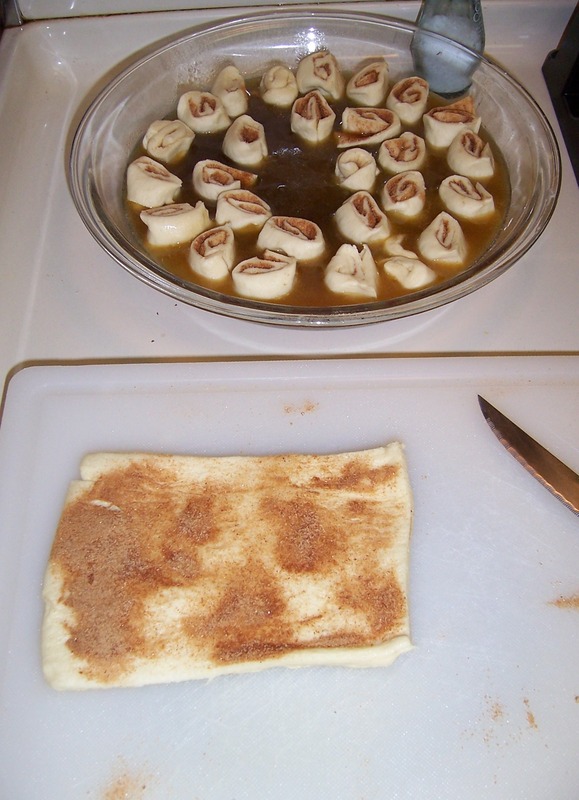 Serving size – 4 mini caramel rolls equals one traditional crescent roll. This week is Restaurant Week (January 20-29). Over 100 restaurant are offering special menus with 10% benefiting Harvesters, our community food network. It’s a great chance to check out some of Kansas City’s Originals while supporting an important resource in our community. I have lots of dinner dates and I hope you will too. Did you know… Harvesters serves 1,274,356 individuals through their member food pantries. Of those 52% are adults, 37% are children, and 11% are elderly. Through onsite feeding programs (such as homeless shelters for victims of domestic violence like Hope House), Harvesters provided 2,491,533 meals. In 2011, I published my first book. Sure, it was self published and I only printed two copies as Christmas gifts for my family. But it got me thinking, everybody has a few things they are really good at. One of mine is cooking. I love cooking and sharing my food with others. I love to entertain with food but my one bedroom apartment isn’t ideal for large parties. Inspired by a friend’s blog, I decided to create my own blog about what I know best – FOOD. My blog will feature some of my favorite recipes, reviews as I try new recipes, and a few anecdotes about how food brings people together.